Home / Blog / A Relationship With God / When you do things right, people won’t be sure you’ve done anything at all. I decided to go back to Church last week. It was the first time I had attended Mass in well over a year, almost two. For the longest time, I didn’t want to go back to Church, mostly because I felt it would be hypocritical to do so. I hadn’t come to a point where I believed God didn’t exist, I just had come to a point where I believed he didn’t care. One of the big tenets of Christianity, of a lot of communal religions for that matter, is the belief in a personal God. That not only does God exist, but that he loves and cherishes all creation, and we must work to have a closer connection with him. And since I didn’t believe in a personal God, I didn’t think it was right to go to Church. I had lost that belief primarily for two reasons: One, because I had seen things during my time working for a humanitarian organization that made me wonder why would God, if he did care so much, allow humans who call themselves “Christians” or “Jewish” or “Muslim” or what have you to carry out deplorable acts, such as stealing from their wives or forcing their infant daughter to sleep in a room full of paint fumes. You read that right. 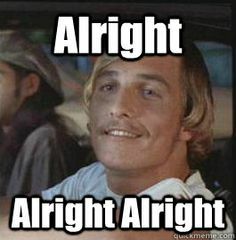 Matthew McConaughey. The actor, producer, model, and man who is setting the bar high for sheer abdominal superiority. For the longest time, I felt that going back to Church would be hypocritical since I didn’t believe in that personal God anymore, and something McConaughey had said during his commencement speech at University of Houston several weeks ago changed my mind. I can’t point to the specific passage or phrase he said that made me suddenly remember how I used to feel about God, but the way he talked about God I could tell was coming from a man who had found a peace with God that allowed him to enrich his life. Which is something I believe is the essence of a true belief in a personal God: the belief itself enriches your life, makes you better at being a good husband or father or professional. Whether or not God really does care is still something I struggle with, but I’ve realized that the belief that God does care is what gives us, people like McConaughey, strength, perspective, work ethic, whatever they need to lead a flourishing life. It reminds me of a Futurama episode actually. 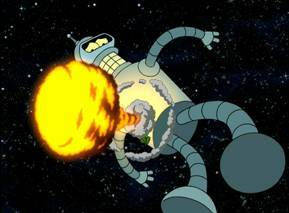 In the episode “Godfellas,” Bender accidentally gets shot out of a cannon into space, and becomes fated to infinitely soar through the universe. At some point, an asteroid hits him, and out of the asteroid comes a group of tiny beings who come to worship Bender as a god. The rest of the episode draws many parallels to the Bible, such as the flood, God appointing one man to speak on his behalf, and ultimately, the complete destruction of civilization and the deaths of all who worshiped him. To me, this is what people mean when they say, “God works in mysterious ways.” Most of the time, God is silent, and acts of God won’t come in grand gestures that throw us off our horses and see the light. Most of the time, we aren’t even sure that what happens is because of God, or because of some other unknown variable, all that matters is what we believe. Did God lead me to every right direction in life to make me read the McConaughey commencement address? Did God will that McConaughey say these things so I specifically would feel the yearning to go back to Church (arrogant though that may be)? Was that God, or just coincidence? I’ll never know. No one will. All that matters is what I believe, and I believe that it’s time for me to go back to Church.